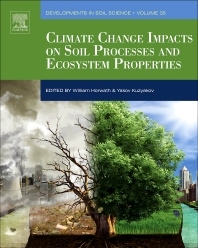 Climate Change Impacts on Soil Processes and Ecosystem Properties, Volume 35, presents current and emerging soil science research in the areas of soil processes and climate change, while also evaluating future research needs. The book combines the five areas of soil science (microbiology, physics, fertility, pedology and chemistry) to give a comprehensive assessment. This integration of topics is rarely done in a single publication due to the disciplinary nature of the soil science areas. Users will find it to be a comprehensive resource on the topic. Professor Horwath is the recently appointed Series Editor for the Developments in Soil Science series and has published extensively in the soil science discipline, including in areas of physics, chemistry, microbiology, mineralogy and fertility. Professor Kuzyakov is an experienced and well-respected European soil scientist. His areas of expertise include soil ecology and biogeochemistry.